Will the creator of Addictive Drums get us hooked? 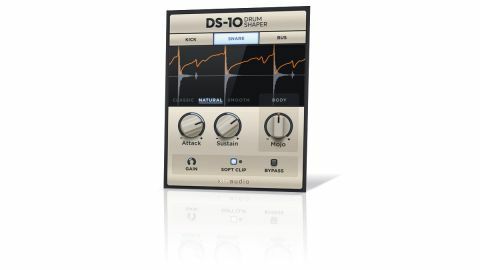 DS-10 brings drum-specific transient shaping to your DAW, cleanly, simply and with excellent results. For Classic mode adds color. Powerful Natural & Smooth algorithms. Mojo feature for further shaping. Real-time waveform and tracer display. Optional output clipper. No input gain. No multi band option. XLN Audio is best known for its Addictive series of sample-based drum and keyboard instruments, and one often-overlooked aspect of these packages is their excellent onboard effects processing. DS-10 Drum Shaper (VST/AU/AAX) is the first Addictive FX, a transient shaper that combines three drum-specific Modes (Kick, Snare and Bus) with a trio of shaping algorithms (Classic, Natural and Smooth). The Mode is selected using the three buttons at the top, and the detection and applied gain curve are optimised for the named drum type. Bus is the most general-purpose option, working well with stereo drum mixes, while Snare and Kick are tailored to the frequency content and characteristic transient nature of those drums. The three algorithms influence the overall decay style, with Classic (the same as Addictive Drums 2's Shape processor) being quite aggressive and 'pumping', Natural more refined, and Smooth having the smoothest decay of all. Transient lengthening and shortening is done via typical Attack and Sustain controls (+/-100% for each), and further enhancement is provided by the Mojo control, which affects a particular 'quality' depending on the Mode: Tightness in Kick Mode, Body in Snare Mode and Presence in Bus Mode. After this you get output Gain, followed by Soft Clip and Bypass buttons. DS-10 also features a real-time input signal waveform display with an orange envelope trace indicating the gain applied by the transient shaper. The choice of algorithm has a more obvious impact on transient shaping than the Mode setting. Classic is by far the most coloured of the three; positive Sustain settings really emphasise tails of snares in that mode, for example. In contrast, thanks to its fast attack and initial post- transient release, the Natural algorithm is very transparent, enabling more careful emphasis of the tail with the Sustain control. Smooth shares the same fast response, but with a slightly gentler initial sustain. One more consideration is that more transient gain is applied with the Natural and Smooth algorithms than Classic. The upshot of all of this is that the Natural and, to some extent, Smooth options deliver cleaner, punchier, louder transients than Classic, and this is most noticeable with kick drums, where Classic sounds positively lacklustre in comparison. The Mojo knob introduces another layer of frequency-specific shaping that dovetails nicely with Attack and Sustain, and its tighter settings are brilliantly effective on kicks and snares, counteracting some of the frequency build-up that results from really long Sustain settings. In Bus Mode, meanwhile, Mojo (Presence) works well as an enhancer or harshness tamer on overheads, and we even had some success applying it to full-frequency sounds such as acoustic guitar, piano and electric bass. Our only minor issues with DS-10 are the lack of input gain, simply to help with gain staging, and multiband operation (especially for Bus mode), which could be useful. Ultimately though, DS-10 is a very useful plugin, offering more targeted and effective tools for drum shaping than your typical transient shaper.